Relax in the hot tub as you gaze out over the Shenandoah River glistening in the sunset, the Massanutten Range and the Alleghenies across the Valley. The most idyllic view on aptly named High Top Rd! 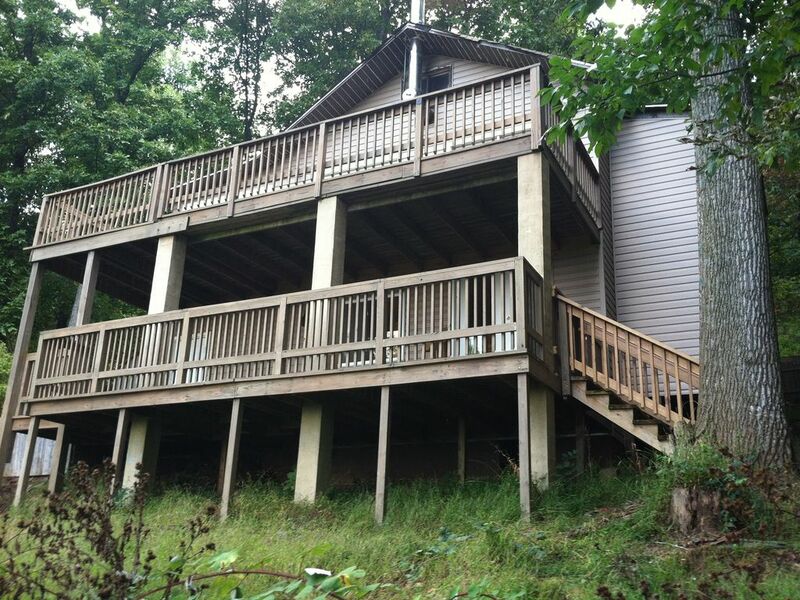 Welcome to Valley Vista Cabin, less than an hour from the DC beltway in the Blue Ridge Mountains of Virginia with magnificent views overlooking the Shenandoah Valley! Enjoy remote solitude above the little village of Linden, just 9 miles from the historic town of Front Royal, the northern gateway to Skyline Drive through Shenandoah National Park. There are 3 bedrooms, 2 full baths, a fully equipped kitchen (including icemaker, coffee maker & grinder, microwave, etc. ), a washer/dryer, and woodstove*. Linens, towels and soap are providedǂ. All you need to bring is your food , clothes and personal toiletries. On the 2 large decks with tables and chairs, are both gas and charcoal grills. (Charcoal is not supplied, but is usually left behind by previous guests.) In the yard, enjoy the 36 jet hot tub, fire cauldron, fire pit, and chimenea (wood supplied). Convenient to local wineries, caverns, Shenandoah River and Shenandoah National Park/Skyline Drive. We are a hands-on operation, living nearby, so your experience here will feel a bit more personal than at a typical vacation rental. We enjoy providing our guests with a special experience and hope that you'll appreciate the idyllic setting and all the little extras offered. The last 1.5 mile of road is gravel. Check our website for a video. We welcome well behaved dogs. There is a $30 pet fee. If the pet fee is not prepaid at booking, it will be deducted from your security deposit refund. Be advised that there is a county-wide leash law. No special safety considerations have been implemented for small children. You should note as well that the environment is not particularly conducive to small children's enjoyment. There's no lawned yard to play in, the terrain is very steep and rocky, and the woods has poison ivy and snakes. Inside and on the deck we have not addressed any child safety issues as we have no experience in that regard and it's not been our focus clientele. There is no community playground, and the youngest kids in the neighborhood are of junior high age. The community lakes have no beaches, lifeguards, or restrooms. The closest playground is about 12 miles from the cabin in Front Royal . Motorcycles are welcome, but even though neighbors on the road have them, every guest who has brought one has complained about the road, so just be advised. * The woodstove is an efficient auxiliary heat source for heating the common areas, however continual use will prevent the furnace from activating and thus the bedrooms will become colder. ǂThere is no extra charge for the number of guests (max 6), but we supply the cabin for your visit based on the number you tell us will be coming. We do offer a 10% discount to active duty military and veterans. Confirm your status with us prior to booking so we can send you an adjusted quote. We post info - about local events, restaurants' specials, Shenandoah National Park statuses, and any discounts currently being offered on the cabin rates - on a popular social network (which VRBO won't allow us to link to or even to call by name here). Surely you can guess - check it out. We've lived on this little mountain for 30 years. Chris is a native Northern Virginian who grew up spending a LOT of time in Shenandoah National Park. We both have backgrounds in various tourist oriented industries and we enjoy showcasing this area for folks. Because it's in an idyllic setting and has an awesome view. It's a hybrid area - a very rural little neighborhood surrounded by wilderness - so we share the environment with abundant wildlife. upper level bath is a 6 jet jacuzzi. lower level bath has picture window view of valley. Very rural - last 1.5 miles gravel road, no sidewalks or streetlights. The tiny village of Linden is 5 miles from the historic town of Front Royal which was chartered in 1788. View of Appalachian's Allegheny Mountains across the Shenandoah River Valley. Standard drip machine - not keurig type. paper towels & napkins. coffee filters. sugar, salt & pepper. anything you might want is likely on site, but if not, we live close by and can probably provide it. fully equipped with pots & pans, dishes, etc. an assortment of board, card, and other games are on site - with many more available on request including puzzles, outdoor games, etc. No lawn! - it's a 45 degree slope. An enchanting woodland garden fallen into disuse over the years and slowly being renovated and brought back to life. Outdoors - a 40 foot walk from the front door. Secluded. State-of-the-art salt system, 6-seater, 36 jet, with a mind-blowing array of options. We chose Valley Vista cabin because: they accepted dogs, and the house seemed dog-friendly for our senior Yorkie, Porky; it seemed close; it looked private with an outstanding view; other guest reviews indicated the cabin was well-equipped. We travel whenever we can, and also camp at our mountain property outside of Petersburg. We schlep a lot of stuff every time, but it didn’t seem that would be necessary with Valley Vista. After our stay, I can confirm all impressions were correct. Upon arrival, we walked in to find a complimentary bottle of wine for us, and a fresh bowl of water along with some biscuits for Porky. Such thoughtful touches for my four-legged furbaby. While pausing on the back deck to marvel at the AMAZING view, Porky sipped from another fresh bowl of water provided for him. We settled into the bedroom on the main level, but the basement bedroom is really nice. Grab that for yourself, if you go with your friends! Lol. The bed and sheets were very comfortable. Shower is also terrific, and, yeah, the tub is a jacuzzi. Winning! The entire cabin is well-kept, and so thoughtfully-appointed. The kitchen has everything you could need. The cabinet above the stove even contains a variety of spices, rubs, etc. The cabinet by the fridge is stocked with hot chocolate, popcorn, and s’mores fixings! While we did not use the hot tub, plush robes and towels are provided. Flip flops, too. And bug spray. These two “house hosts” are awesome. Literally anything you could think of, they already beat you to thinking of it. Oh, and the rack of literature, brochures, maps, etc. in the sitting area makes the Visitor’s Center look shabby. I truly enjoyed the décor of the cabin. On the dining room wall is a cool topographical relief map of the Shenandoah area. I loved the pictures from the Pawcasso Exhibit at the Humane Society of Warren County (flowers made from the paw prints of sweet doggies). We used the provided binoculars to do a little bird watching, too. Drove Skyline Drive, did some trail walks, but were still able to enjoy Netflix at night on the smart TV. Cooked on the MASSIVE grill both nights, and enjoyed our meals on the deck. A weekend is just not enough time. We will absolutely be back again, and highly recommend the property to anyone. I’m not sure how Chris and Steve make money with this rental because they clearly reinvest into the comfort of their guests. Very thankful for our choice, our hosts and our wonderful weekend. Wonderful weekend getaway at Valley Vista! Our group of five friends spent Presidents Day weekend at Valley Vista. What a treat! First and foremost, Steve and Chris were incredibly responsive from beginning to end. Any questions we had were fielded and resolved promptly. Of course, those were few and far between, as Steve and Chris had thought of every possible detail already! We walked into a bright, cozy, and welcoming home upon our arrival. And I emphasize "HOME" because it did not feel at all like a rental. Helpful signs and instructions can be found throughout the house to guide and inform you. A binder kit with key tabs tells you everything you need to know. Next to the binder was a complimentary bottle of local wine for us to sip and enjoy! There are windows everywhere, and Valley Vista has a surprisingly open floor plan. The kitchen has ample dishware, cookware, utensils, a coffeemaker, French press, popcorn maker, snacks, spices, toaster, full-size fridge, microwave...and even a dishwasher to boot! Two full bathrooms (one upstairs, one downstairs) with tub/shower combo and towels made sharing much easier. Cable-equipped Smart TV with Netflix/Amazon and DVD player in the living room was ideal for watching scary movies. Not to be overlooked is a really adorable woodburning stove/fireplace, an almost too-perfect touch in a house oozing with charm! The cabin's outdoor amenities did not disappoint. Two separate, furnished decks with a cute little bar on the upstairs one; great gas BBQ grill was put to good use; spacious yard area with table/chairs and hammock for lounging; a fire pit with log stumps for roasting marshmallows; and, last but not least, a saltwater hot tub complete with fancy, plush bathrobes and useful flip-flops! Our only minor quibble was with the bed mattresses and couches, which could use an upgrade for additional comfort. A handful of houses sit in the vicinity of Valley Vista, providing plenty of privacy but also a level of comfort that we weren't too far off the grid! Access to hiking on the Appalachian Trail is a short drive away, which we took advantage of for three hours one afternoon. Downtown Front Royal (and the local brewery!) is not too far either, if you want to get out for a nice stroll through quaint shops. The listed photos simply don't do it justice. Considering how reasonably close Valley Vista is to DC, would definitely come back for another (maybe longer) trip! Could not really ask for much more! Thank you for being our guests and for your positive comments. We are glad that you all enjoyed your stay and had fun. The mattresses are all just 4 years old and upper end. We get comments - too soft, too hard. It’s hard to please all based on their preferences. We look forward to your next visit. There are hundreds of miles more to hike on the Appalachian Trail. This was a short vacation, but I was so happy with everything about the stay. The house itself was older, but well maintained and had everything you could possibly need on vacation except clothes! There were even a few surprises that were so nice to find like robes and towels for the hot tub, a fully equipped kitchen and extra blankets. Definitely recommend and cannot wait to be back possibly in the summer. The three of us and three dogs loved our 3-day weekend at Rainbow Valley cabin. Cabin is spacious and comfortable with state of the art hot tub, comfortable beds and chairs, great views, and a fenced yard for the dogs. Lots of thoughtful touches, such as smore fixings, fresh eggs, extra toiletries, plenty of outlets, lamps, and seating. We hiked in the G R Thompson Wildlife Area and Compton Gap trails in the SNP. We picked up locally grown produce and meat at the nearby Giving Tree. The owner Chris is very available and attentive. We can't wait to return. This was their second stay with us but their first at Valley Vista Cabin. We were glad to host them again and look forward to their next visit. We are always happy when our guests appreciate the cabin but also when they spend time visiting the local attractions and businesses. Enjoyed our stay at the cabin. While the main draw was of course the hot tub and the vista views of the valley below, there are plenty of other reasons to stay at this lovely cabin. Everything you could possibly need is on hand. WiFi connection was easy and very good. If you need a place to escape and completely reconnect with your friends and family, this is the place. Donna and her friends were great. They were very respectful of the cabin and property and left both in great shape. Thank you and we hope to see any/all of you again in the future. This is one of the best rental homes I've ever stayed in. There were so many great amenities like a fire pit, super fancy hot tub, 2 decks, grills, and lots of special touches that other houses don't have to make your stay comfortable and easy. The view is amazing and you can see it from the living room, dining room, deck, hot tub, fire pit, and even in the shower. Julie and her husband were super guests. The communication was good and they left the cabin in super shape. We like that they appreciated and enjoyed all of the extra amenities that we provide to make it a special stay. Great base of operations for visiting wineries, caverns, historic sites, sightseeing through Shenandoah Valley and Shenandoah National Park.